Christmas card season! I love this season so much. Being able to catch up with family and friends over the year and see how the kids have grown and how families have changed or who went on vacation where. I love seeing the snapshot of their year and their family. A great feeling of connectedness during the holiday season! This year, I LOVED our photos from Lauren Neff (see our family photos here). They were full of green and nature and I went for a deep green and navy theme with all of our outfits. I LOVE the hunter green trend I’m seeing everywhere right now, just look at all of these! The “berry merry” trend is seriously stunning as well! 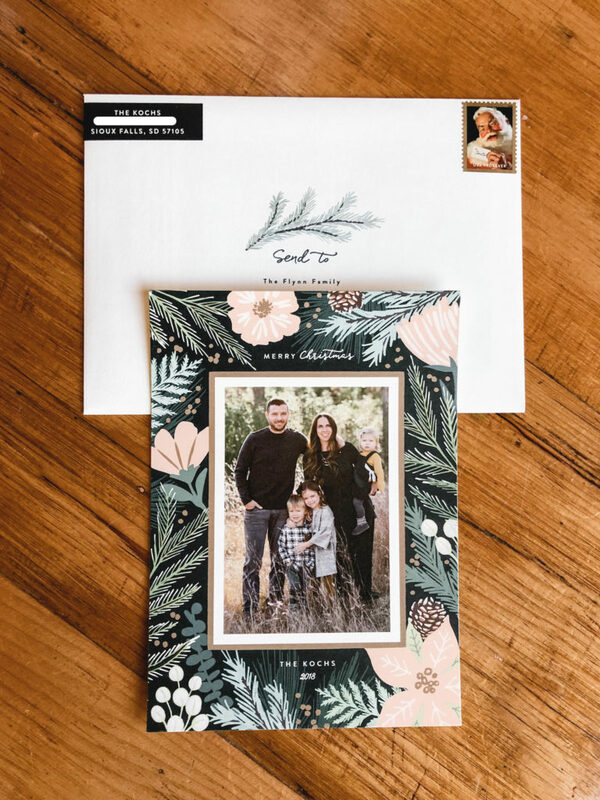 Usually, I am all about simplicity in a holiday card (see ours from 2017, 2016, 2015), let the photo do the talking, however, this year, give me all the bold florals! Maybe it’s my obsession with large bloom floral wallpaper (basically every wallpaper on here!! ), but this “Lush Winter Foliage” card was exactly what I was imagining to match our photos! I really loved the border of florals that surround our card, it perfectly accentuates our outfits and nature, so pretty. And the pop of blush pink makes it feminine and calming to me. Plus the tanish/gold border frame looks beautiful with the wheat grass in our photo. Really love our card this year! It was actually an easy decision for me this year, I’m one of those people who have to see 100 examples before picking one, but this year, I went straight to this design! 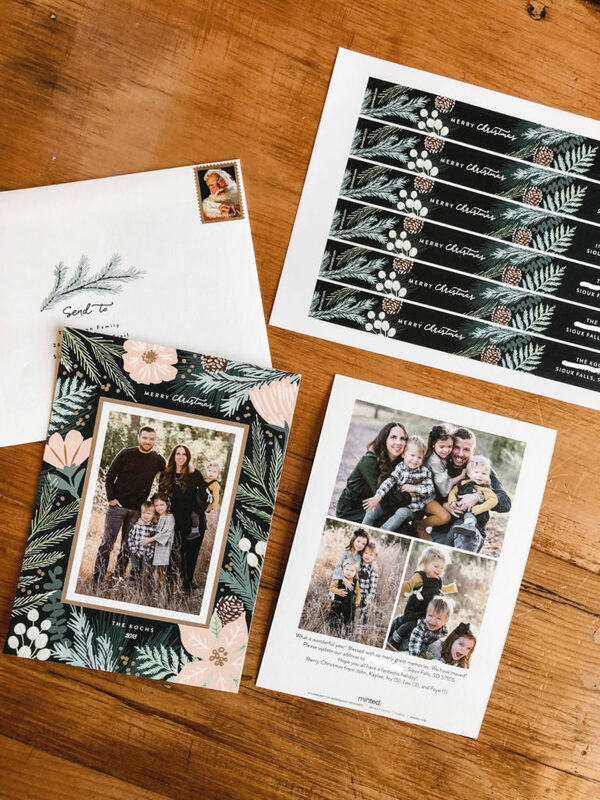 The design is from Minted, my go-to for holiday cards. I love them because their quality of cards is very very nice, plus their designs are so fabulous and beautiful. 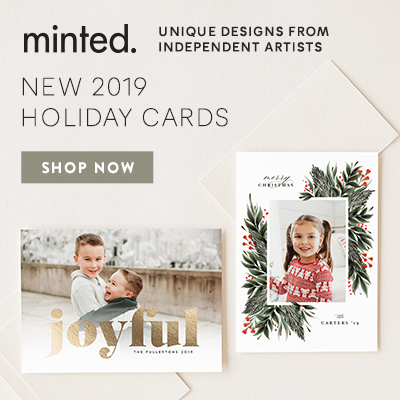 I always find my favorite design on Minted. PLUS, a HUGE BONUS, they offer free recipient addressing with a matching design to your card. It really spruces up the envelope and makes for beautiful mail! And it’s FREE! So easy to just upload your addresses and eliminate all the work addressing your envelopes! Plus, this year, I went with the return address stickers that also match our card, since we have a new address and I haven’t updated my stamper yet! They just wrap right around the envelope so that the return address is on the front and the design is wrapped around to the back. So nice. AND pretty. It has been so fun seeing our friends and family’s cards so far this year. I love to display them on our wall as a reminder of all of our loved ones during this holiday season! A little cheer :) And, after the New Year, I love to take a hole punch and punch the corner of the cards and put them in a 3 inch book ring. I keep them and take them out as a photo album each Christmas. It’s so fun to flip through and see how families (including my own!) have changed. Here are a few more of my favorite cards from Minted, Tiny Prints, and our local store Harold’s. Hope you all are having a happy holiday season! Christmas is right around the corner, EEEK!